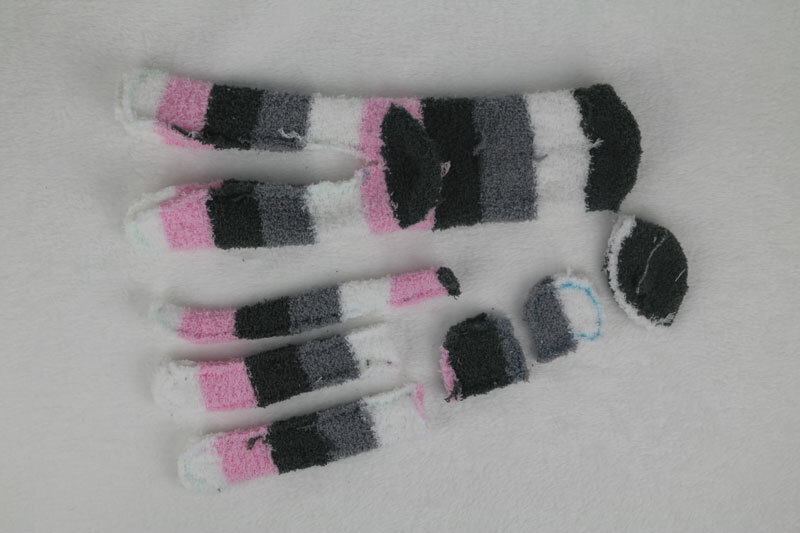 How to Make a Sock Monkey with a Sock Monkey Pattern PDF! 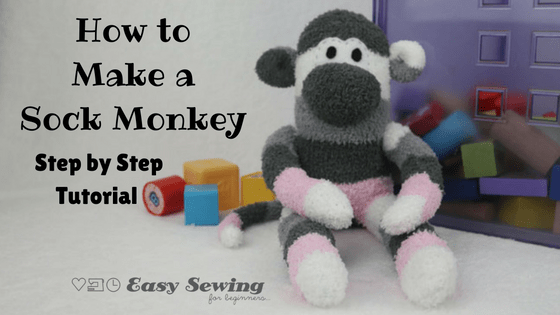 Here’s a step-by-step tutorial for how to make a sock monkey with a sock monkey pattern PDF template to download as well. I’ve made a video to go with it because that’s the way I learn best and if you’re anything like me (busy and just want to see it so you can do it) you’ll benefit from a video to. The video is epic, as it’s over one hour long. I’m not going to lie to you, these cute critters do take a couple of hours, if not a few, to make so set aside some time, have everything you need ready, and watch the video and make your sock monkey along with the video. You’ll find the video at the end of this tutorial! 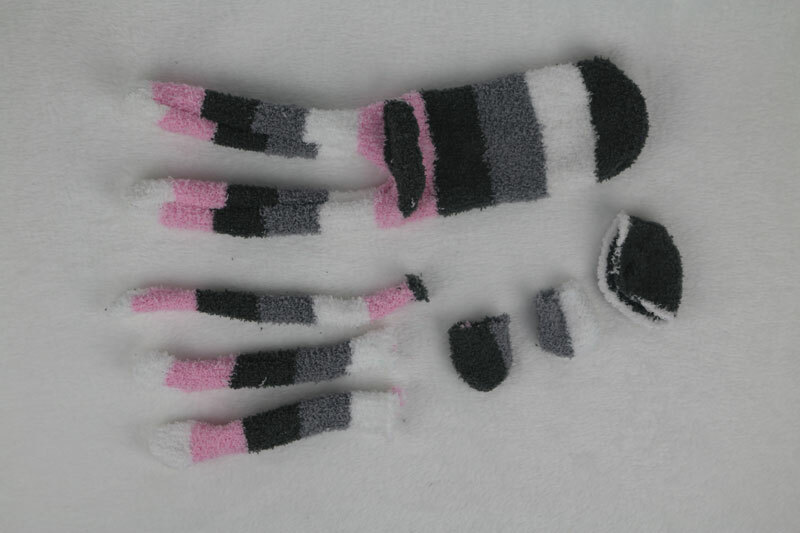 Sock Monkey pattern free, but you can purchase the, ad free, thank you edition here! So let’s get started with how to make a sock monkey! Free sock monkey pattern PDF template download here or get this full tutorial in one handy tutorial PDF with the pattern! 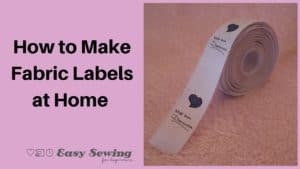 See my step by step video tutorial for how to make fabric labels at home! Turn the pair of socks right side out. Ensure one sock has the heel centred. 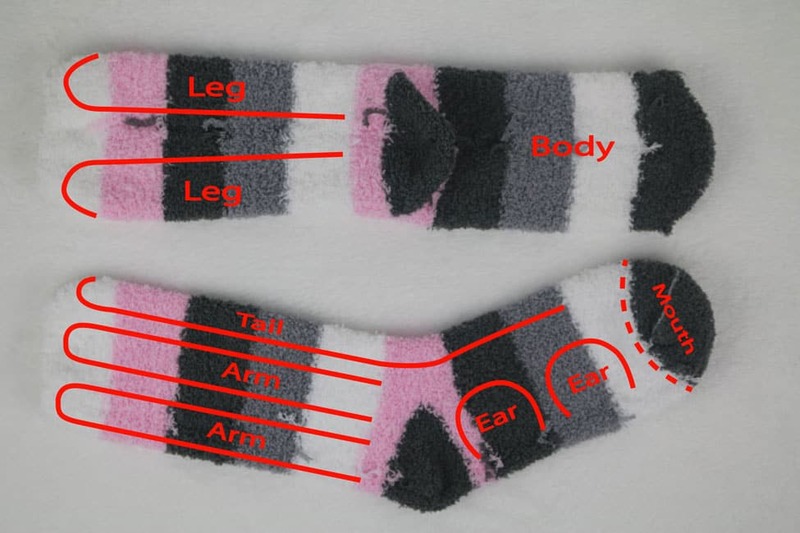 Draw the lines on the socks for all the body parts needed as indicated in the diagram. Trace the ear template provided (download the free template here), if desired. Otherwise you can draw your own ear shapes. Sew along all the marked solid lines (cut out mouth part only) using a triple stitch or stretch stitch. On the sock for the body and legs, cut between the two leg seams and trim around the curves. Cut an extra 1/2”/ 1 1/2cm past the top of the sewn seam lines to create a larger opening between the legs for turning. Cut out the arms, tail, ears and mouth being careful not to cut through the sewn lines. Turn al the parts right side out. Use the turning and stuffing tool to make this task easier and quicker or you can also use a chopstick or the blunt end of a pencil. 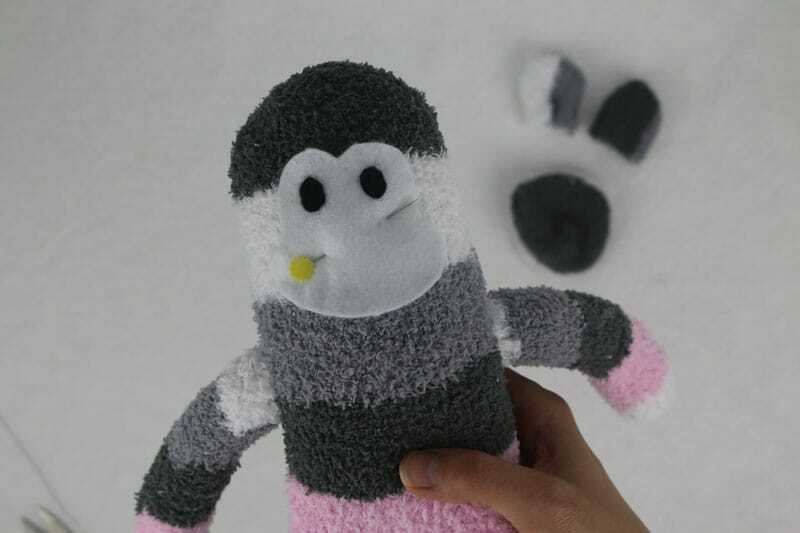 Use the toy filling to stuff the body and legs as well as the arms of the sock monkey. I like to use the awesome turning and stuffing tool you can see in the photo below. You can get them from your local sewing store, Amazon in a small or large size or eBay! I like to leave the tail as it is, but you may fill it with toy filling if you like. 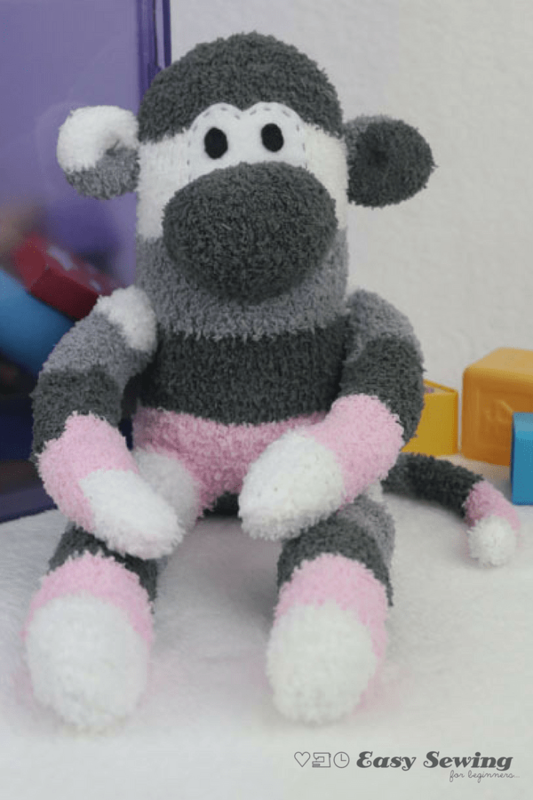 Use a ladder stitch to close up the opening on the body of the sock monkey. See my step by step video tutorial for how to do a ladder stitch! Use a ladder stitch to hand sew the arms and tail into place, ensuring the raw edges are tucked in. I sew around the arm twice to make the stitching extra secure. Tip: Placement of the face, arms and ears can be unique for each sock monkey. You can pin these parts in place first to get a feel for where you think it will be best to sew them on. Trace the face template (found in the free template download for how to make a sock monkey) onto white felt and cut out. Cut two small circles from black felt and sew into place using a running stitch. You can use the template provided as a guide for the size of the eyes, or you may like to use buttons if it’s for an older child. Pin the face piece into position on the body of the sock monkey. Use a running stitch to secure the face piece onto the body. Fold the raw edges of the mouth/nose piece in (use a large basting stitch to hold this edge under if desired). Pin the mouth piece over the bottom part of the face template, ensuring that the toe seam is at the bottom. 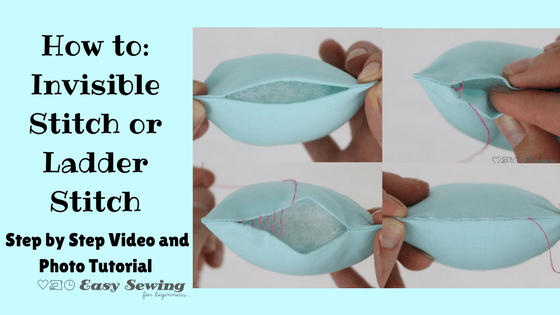 Sew on the mouth/nose piece using a ladder stitch. Add stuffing when there is a 1 1/2” gap remaining. This can be a very tricky bit, but sew on a mouth line, where desired, using a backstitch. You may find this easier to do just before closing up the gap of the mouth/nose piece. Remove the basting stitch, if used. Lastly, tuck the raw edges in for the ears and use a ladder stitch to sew into the desired position. I tend to sew them on in line with the eyes. A Handy Tip: Before sewing in place, tack the corners of the ear piece together to give a nice rounded shape. It also creates a cute ear hole effect. These little creatures are full of character. It’s worth the time to make these to see the happiness you can create for a little one (or older one really!). 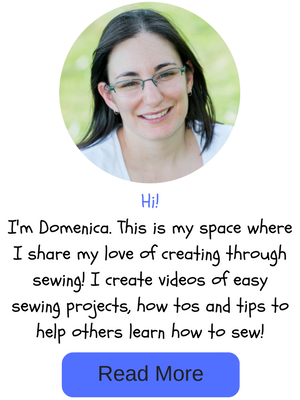 With the video to guide you, it would make a great sewing for beginners project. You can do it! 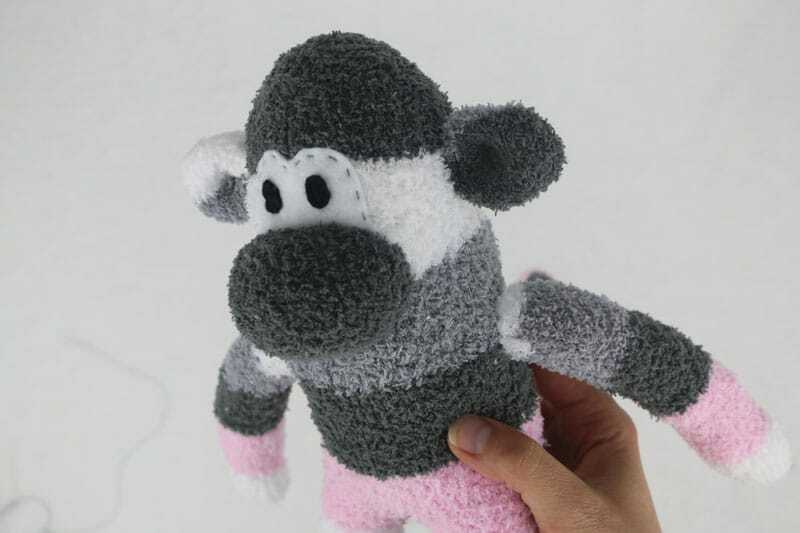 I would love to hear how you go with the tutorial and if it has helped you work out how to make a sock monkey. Don’t forget to send me any pics of your creations. I would love to see them! If you would like to purchase the sock monkey pattern PDF, ad free, then you can do that right here! Thank you! P.S. you may like to check out the sock monkey that I left for an unsuspecting stranger here on The (secret) Toy Society blog. 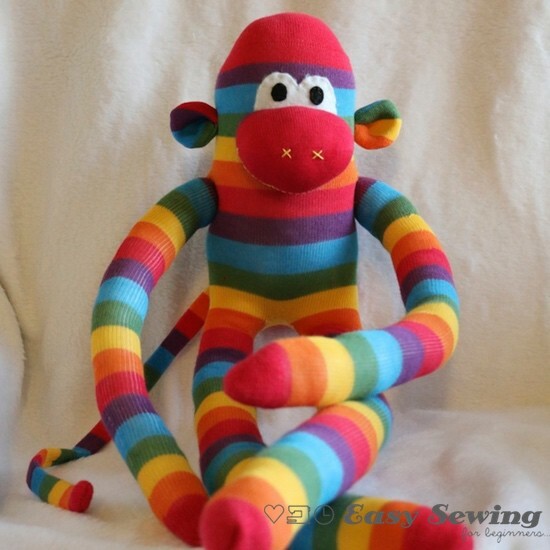 I also love using knee high socks to make sock monkeys, like this one, with extra long arms and legs! Absolutely adorable ? thanks for sharing. 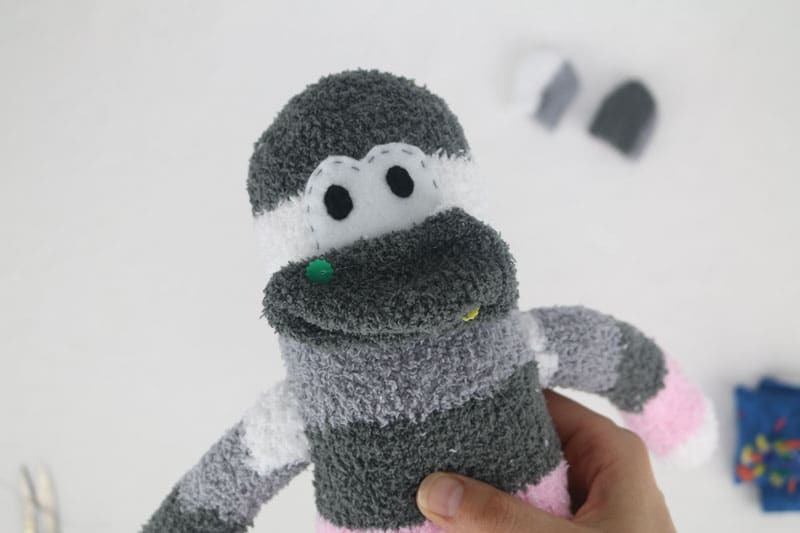 Gosh, I love this sock monkey tutorial!! So cute!! I think I need to buy some fuzzy socks and make them with my kids. Thanks for the tutorial! I just published your submission. Thanks, Denise! Greatly appreciated ? Just bought my socks and supplies, can’t wait to make my 2 sock monkeys…AWESOME!!! Thank you so, so much for sharing! Love your pattern selections and creativity! :)) Looking forward to trying some out!! Love your pattern selections and creativity!